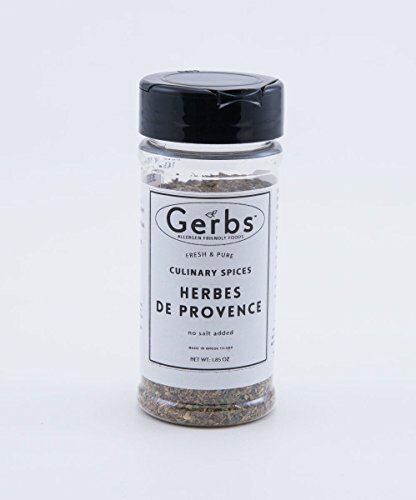 Herbes de Provençe(Salt-Free) is a sweet, herbaceous seasoning with licorice overtones. Excellent with chicken and meats, and fish; use about 1/2 - 1 tsp per lb. Also great with eggs, vegetables and soups. Add 1 Tbsp per 1/4 lb. butter to make a flavored butter that compliments steak, fish and vegetables. Amazing BBQ Grilling Rub - Apply to your favorite meat, up to 24 hours prior to grilling/smoking/baking. Excellent vegetable topper, great with grilled or steamed farm fresh summer veggies! Gerbs Allergen Declaration - Our Lines are Gluten, Wheat, Peanut, Tree-Nut, Legume, Soy, Egg, Milk/Dairy, Sesame, Mustard, Shellfish & Fish FREE! Packaged on Dedicated Equipment by Gerbs in our Factory! If you have any questions about this product by GERBS, contact us by completing and submitting the form below. If you are looking for a specif part number, please include it with your message.